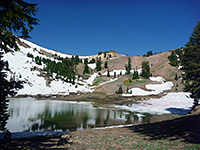 The Ridge Lakes Trail is one of Lassen's lesser used paths, even though it begins at the busy parking area beside the Sulphur Works thermal area, along the scenic drive just north of the visitor center. 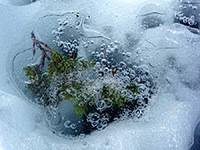 The trail ascends a steeply sloping hillside between two creeks, through a mix of grassland and forest, to two small lakes, set in a high, sheltered basin beneath a ridge extending north from Brokeoff Mountain. The attractions of the one mile hike are the views of the inaccessible upper section of Sulphur Works, the many wildflowers on the lower slopes, and the seclusion of the lakes; while not as spectacular as some in the national park such as Terrace and Cliff, the Ridge Lakes are an ideal destination for a half day hike, and as with all others in this region, are most scenic when some of the winter snows remain, when the turquoise-white surface is still partly frozen. The trail is usually accessible from late July, though may not be entirely snow-free until well into August. 12 views along the Ridge Lakes Trail. The path starts at the edge of the large parking area at the Sulphur Works, next to the rest rooms, and starts climbing right away, up a grassy ridge between the main branch of West Sulphur Creek to the east, and a lesser tributary to the west. 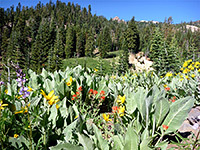 The ground is quite open at first, covered with abundant flowers in summer, including mule's ears, blue pod lupine and Indian paintbrush; the lack of trees allows good views over the adjacent thermal area and across to the nearby volcanic peaks. Somewhere in the woods to the west, on the far side of the valley, is a small thermal pool named Tophet Springs, and there are several mudpots a littler further off trail to the northeast. The surroundings change to light fir/pine woodland, and the path gradually steepens, becoming ill-defined in places, especially early in the hiking season when large snowdrifts may be present, yet the route is quite straightforward - directly up the slope keeping close to the creek to the northeast, which eventually leads to the lake. The total elevation gain is just over 1,000 feet. In late summer there are two lakes, separated by a gravel bar, but they merge at times of high water levels, when the snows are melting. Even then, the lake is quite compact, enclosed on three sides by smooth, steep, reddish slopes, rising to a ridge linking Brokeoff Mountain with Mount Diller; it is quite easy to climb 300 feet to a saddle on the ridge, though much harder to reach either of the summits.